Ireland's Department of Finance has published the arguments it intends to make against the ruling, while Apple is now ready to file its appeal. Apple will this week file its appeal of a European Commission decision that it owes Ireland billions in back taxes, while the country's Department of Finance has revealed details of its own appeal. 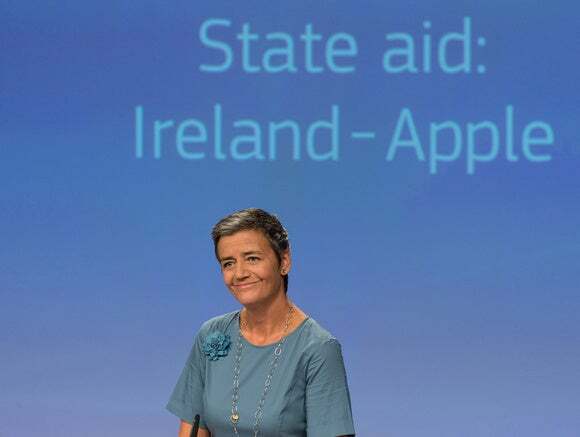 European Commissioner for Competition Margrethe Vestager said on Aug. 30 that Apple must pay up to €13 billion ($13.6 billion) in back taxes, plus interest, because opinions given by the Irish tax authorities in 1991 and 2007 constituted illegal state aid. Her decision concluded a two-year investigation of the company's tax affairs stretching back to 2003. Apple CEO Tim Cook dismissed Vestager's ruling as "total political crap" in an interview with the Irish Independent newspaper on Sept. 2, and announced the company's intention to appeal. Over three months later, Apple is now ready to file that appeal with the General Court, the European Union's second highest court, the company's General Counsel Bruce Sewell and Chief Financial Officer Luca Maestri told Reuters in an interview published Sunday. The Irish government decided to appeal the ruling alongside Apple, and on Monday the country's Department of Finance published an outline of its arguments, saying the Commission misunderstood the relevant facts and Irish law. Hours later, the Commission released a redacted version of its full ruling in the case, which it had not previously published. The Commission is wrong to claim that the 1991 and 2007 tax opinions "renounced" tax revenue to which the country would otherwise have been entitled; Instead, the department's argument goes, the opinions correctly applied Irish tax law in only taxing the profit attributable to Apple's Irish branch, and not the company's non-Irish profits. The case presented by the Commission revolved around the activities of the Irish branches of Apple Sales International (ASI) and Apple Operations Europe (AOE). These branches carried out routine functions but all important decisions were made in the U.S., so profit deriving from those decisions should not be attributed to ASI and AOE, according to the department. Furthermore, the department said, the Commission tried to apply principles that do not exist in Irish tax law, failed to follow required procedures, wrongly invoked novel legal rules, and exceeded its powers and interfered with Irish sovereignty. A summary of the Irish government's legal arguments will be published in the Official Journal of the EU before the court hears the case.